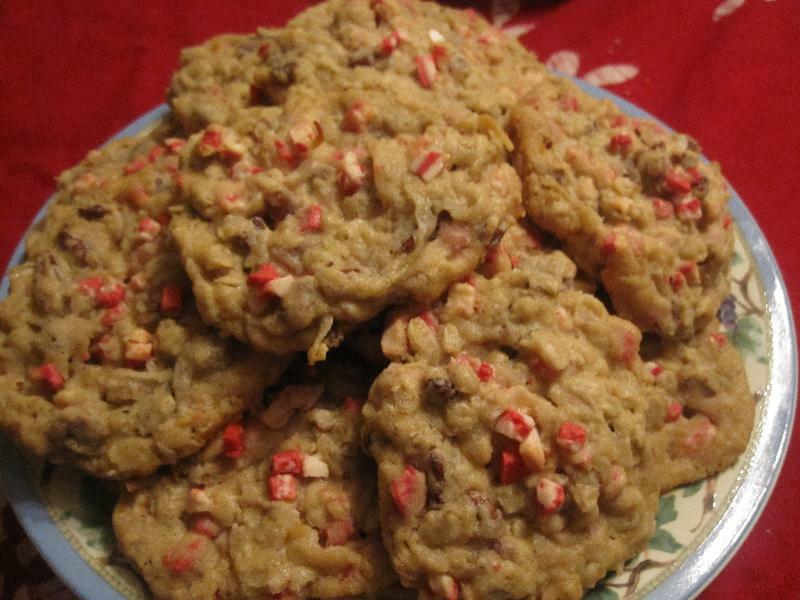 The recipe for these cookies is located on the back of the Andes Peppermint Crunch Baking Chips. Use an electric mixer to cream the butter and the sugars until fluffy. About 3 minutes. Next beat in the egg and vanilla. On low speed add in the baking soda, salt, and then the flour.Mix completely. Stir in the oats, coconut, pecans, and Andes Peppermint Crunch Baking Chips. Measure out 2 tablespoons of dough for large cookies or 1 tablespoon of dough for small cookies. Place the round balls on lightly greased cookie sheets two inches apart. Press lightly. Sprinkle some of the remaining chips on top of each cookie. Bake for 20 minutes for the large cookies. Bake 12-15 minutes for the small cookies. Do not over bake. They get crunchy on the outside, but remain soft on the inside. Remove from the cookie sheet and let cool.